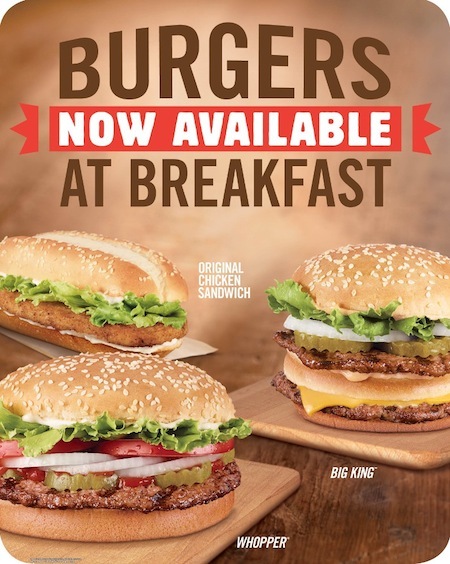 Rather than expand breakfast into lunch time, Burger King is making burgers part of breakfast. The Burgers for Breakfast sandwiches are not new burgers or breakfast-type variations on BK standards. It’s literally just the chain’s signature burgers — Whoppers, Double Whoppers,the Big King, Whopper Jr., cheeseburgers, double cheeseburgers, Bacon Double Cheeseburger — along with the Original Chicken Sandwich and french fries. So it’s basically the core of the lunch menu, just served during breakfast hours. According to BurgerBusiness.com, a number of Burger King franchisees have been violating the company’s standard 10 a.m./10:30 a.m. start to the lunch menu by offering burgers early, so this official rollout of Burgers at Breakfast just gives corporate blessing to something that is already happening. BK says that 5,000 of its restaurants have already agreed to run the Burgers at Breakfast program, but not all of those locations are offering the mixed menu just yet. Some franchisees are waiting for official marketing materials, like drive-thru signage, to arrive before they start offering the menu to customers. “Selling Burgers at Breakfast at Burger King restaurants allows our guests to start their day being their way,” a shill for BK tells BurgerBusiness.